Bridal Makeup and hair styling has always been Kavis speciality. 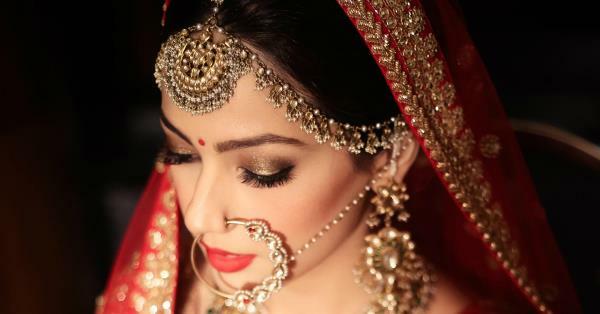 Today, we have evolved into an end-to-end concept provider for the bride, groom and their families covering pre-wedding treatments, makeup, hair styling and mehendi. While most people go in for a variety of treatments, styling and grooming closer to their wedding day, they tend to ignore the stressful weeks and months leading up to the big day, which can have damaging effects on your hair, skin and overall look before your wedding day. A bride or groom should start their pre-bridal treatments at least 8-10 weeks before the wedding. A pre-bridal package can be customized to include treatments for hair, skin and body. Pre-bridal treatments are completely customized by identifying the brides needs with respect to skin tone, texture, hair texture and other skin therapies and treatments. Deep conditioning hair spa treatments 3 sittings with which you get 1 complimentary sitting. These treatments have solutions for most hair problems like dry and damaged hair, hair loss, dandruff, lack of volume and oily scalp. Enrolling for 2 rounds of this package, which is about 8 sittings over a course of 2 months, benefits hair, making it lustrous for the wedding. Cellophane shine and protein treatment are quick-fix solutions in case 8 sittings do not fit into your timeline. A one-time sitting would have an effect that lasts 4-5 weeks. This can be done in combination with hair spas (4 spas with 1 shine treatment or 8 spas with 1 shine treatment). It is ideal to have this treatment a couple of days to a week before the wedding. We also advise brides to go for a package in hair restyling, colouring, perming or rebonding depending on their personal choice. A good cut and style is an absolute must for a bride and should ideally be done 2 weeks prior to the wedding. Along with a new style, some colour and highlights, streaks or flashes work excellently to bring out a more glamorous sophisticated look. If the hair is too flat and falls limp a soft perm is a good option which will give your hair soft waves and volume. You can have permanent hair extensions as well; they are now available in the best quality of hair and look absolutely natural. They can be treated like natural hair and make your hair thick and long. On the other hand if the hair is too frizzy and thick, straightening is a good option as it will make it more smooth and soft. This may also be done 2-3 weeks before the wedding so that style sets in well. We customize all skin treatment packages to the individual needs of the bride and groom as each person has a unique type and character. A facial treatment is the most basic treatment for brides. We offer a range of facials including layer advanced skin lightening, Pearl, Gold, Vitamin C & A or Skin Radiance. These help clear the skin and remove tan, as well as give the skin glow and shine. Facials are normally combined with lightening packs to improve complexion. We recommend firming for the eyes which revives tired eyes with a cooling treatment and instantly reduces puffiness and lines. Ideally, one can go in for 2-3 treatments for hands and feet. We recommend Paraffin Wax or Crystal SPA Pedicure or Manicure. These help in tan removal. Waxing is an absolute must for brides. Ideally a gap of 1 month should be given before the final waxing, the whole growth will then be there for the final waxing. This should be done 3 days before the function.